Although the majority of the population would agree that they want to attain success in their professional lives, the truth of the matter is that a very small percentage of the population is able to actually achieve success in their careers. 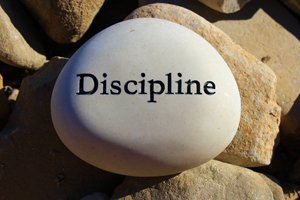 There is one particular trait that seems to appear in successful leaders over and over again: discipline. Of all of the important qualities that an entrepreneur should strive for, discipline tops the list for building a successful business. After all, discipline is the trait that helps us to continue even when the road is long and difficult and things are not going the way we thought they would. Having discipline helps everyone overcome these difficult challenges. Self-discipline is defined as "The training and control over oneself and one's conduct, usually for personal improvement." In effect, self-discipline is a skill that not everyone has developed, and it is also one that requires consistent maintenance and effort, as there are many struggles and sacrifices that will be required along the way. Discipline is often based on the determination to remain disciplined even when you face challenges and would rather give up or give in. Just as an athlete requires discipline in order to finish his or her race first, an entrepreneur requires discipline in order to reach his or her business goals. Thus, discipline is a very important trait in leaders and entrepreneurs, as it will be necessary when starting or improving your company. Disciplined leaders will focus on their business, and while they will acknowledge the difficulties that appear along the way, they refuse to let these challenges become too distracting. Because there will be plenty of distractions along the tough road to starting a new business, it is important to practice the art of self-discipline before you embark on this journey. Anyone can train themselves to be disciplined if they are willing to put in the effort, and once you embark on this journey, you will soon see that the benefits of being disciplined far outweigh any cons. So how do you become disciplined in creating or improving your business? Plan: Everyone needs to create a detailed plan when they are starting their own company or business. Even when you want to make significant changes to a company you created years ago, you will need to sit down and write out a plan. This will help you to account for a variety of details, including accountability, tools you're going to use for measuring success and milestones, and other important details that are necessary to begin (and continue) on the right track. Purpose: Everyone needs to have a purpose, and those who are starting or improving a business are no different. You need to consider your vision and your overall short-term and long-term goals. Determining these details now will help you to maintain discipline in following through with each step of your plan. Rewards: As with many goals in life, it is always a good idea to create rewards for the small successes you achieve along the way. This will help you to stay motivated and focused, as it might be months (or years) before you reach your final destination. Faith: You will need to have faith in both your abilities and your plan. If you put in the energy and effort required to create a plan, then you have to believe that it is great. While it's very rare for everything to go exactly according to plan, it's important to recognize that in spite of any hiccups along the way, you are on the path to success. Bottom Line: Discipline is a key trait that can be found in any successful entrepreneur or leader. Striving to stay disciplined will set you apart from the masses and will help you to achieve success.